One of the things I loved most as a kid was piling into the car with my siblings and parents and taking a trip to see the grandparents. I had two sets of grandparents and both lived in tiny Illinois towns that required what seemed like a day’s drive through the midwestern countryside. Of course the drives were really about 30 minutes or so, but when you are ten and arguing with your sisters about their legs invading your seat space (“MOM! Jill’s leg is crossing the border into my seat area!”), it seemed so much longer. I’m sure my parents agreed. We may have been close to home, but it seemed like a whole different world—fields of towering corn that seemed to go on forever, the smell of pig manure that would fill the car (and that we would blame on our sister Amy), and all those beautiful cows that I thought were the farmers’ pets. I’d look at those farmhouses perched alone in the center of nowhere and wonder if it was super relaxing or super scary not to have a neighbor within a mile or two. 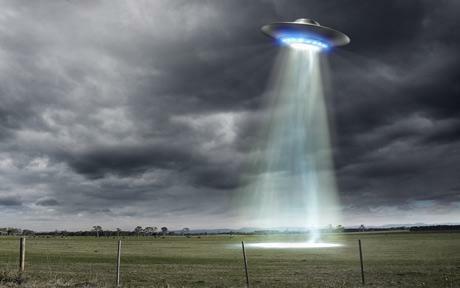 From my extensive knowledge gleaned from comic books and horror films, I figured they were prime targets for an alien abduction or an attack by an escaped one-armed patient from an insane asylum. I mean, during the day these wide-open landscapes looked like the subject of a Grandma Moses painting, but at night they were the perfect setting for The Walking Dead (“Wilbur, there’s a growling young man on the porch without one side of his face. Should I invite him in for a piece of pie?”). You can get drunk on the north or the south side of the street in Mendon. It was a different world when we arrived in these far away towns, though. 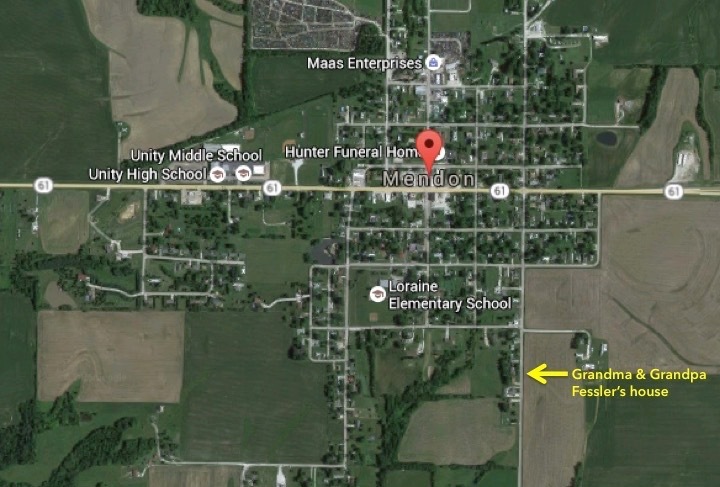 Mendon, Illinois, home of Grandma and Grandpa Fessler, had a tiny downtown, really nothing more than a line of squat commercial buildings along the highway that sliced through town. There was Strickler’s grocery store where we bought many a can of Pringles and jars of Tang, and the Variety Store packed full of, well, a variety of things made of plastic that gave the store it’s memorable and brain-cell-killing scent. And best of all, in a town of less than 900 people, there was not one, but two taverns packed with people, right across the street from each other. I like a town that knows its priorities. Grandma and Grandpa lived in a minty green ranch style home about five houses from where the town ended and the blacktop road turned to gravel. There was an expansive field across the street from them with a grey barn and silo in the distance, and another big field behind them with a weathered red barn. Even though we could drive from their house to our house in the time it took to watch an episode of the Brady Bunch, it still felt like I was smack in the middle of nowhere. Grandma and Grandpa McClelland lived in the even tinier town of Meyer, Illinois (if you look at the shape of Illinois as the profile of a fat guy, Meyer is the bellybutton on the protruding stomach). Sitting on the east bank of the Mississippi River, it’s 100 or so residents were separated from the muddy waters by a levee 20 feet tall (only 10 people live there now due to devastating floods in 1993 and 2008). I loved staying in Meyer on my summer vacation because it seemed even more remote than Mendon–I could count on my hand how many cars drove down by in a day. downtown (geez, there was hardly even a town) but there was…wait for it…a tavern! And it had a stuffed raccoon outside the door that made a noise when the bartender inside pushed a button. yellow wheat field across the road contrasted against an ominous slate blue sky. 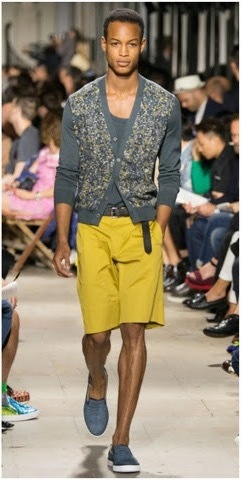 Why couldn’t all landscapes be the same color as the Hermes Spring/Summer 2015 men’s collection? Looking at cobalt blue and yellow in the landscape…. Looking back on my childhood, I really wonder if my brain was warped from eating too many Pop-tarts, because it seems weird that I liked nothing better than being far away from home in secluded, isolated places (I’m pretty sure that is one of those things you see on the list of characteristics of a serial killer). But I loved visiting places that seemed undiscovered, off-the-beaten-path spots where adventure and surprise awaited around every corner, e.g. 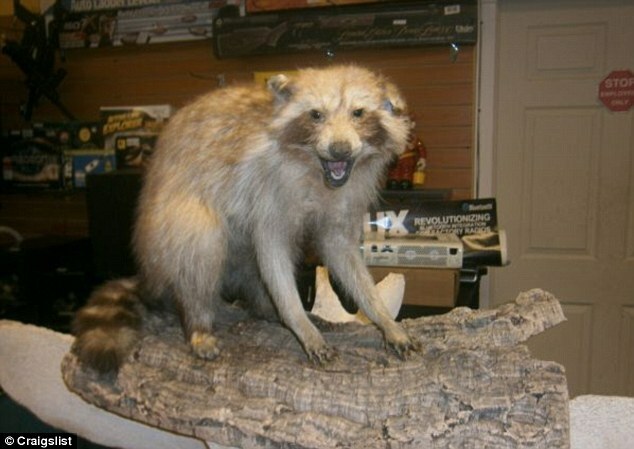 stuffed raccoons, dueling taverns, etc. 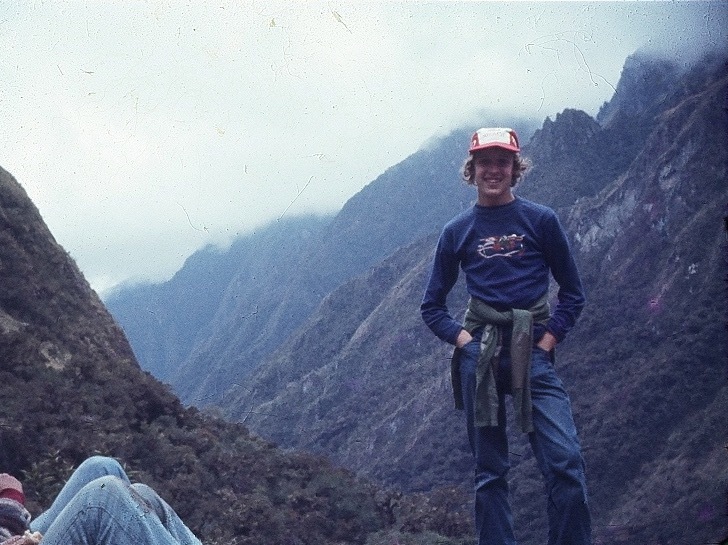 Greasy hair and sore feet on the ancient Incan trail to Machu Picchu. I continued to explore this odd desire as I got older. In high school, while most kids were loitering at the mall, my friends and I frequented abandoned farmhouses in the countryside surrounding my town. As a high school exchange student living in Peru, I got to hike three days with a small group along a remote, ancient, Incan trail to the ruins of Machu Picchu. I remember this trip for several reasons: 1. In three days of hiking we saw only two other humans; 2. It was the first and last time I went three days without washing my hair; 3. I’m not a fan of remote places that require long hikes. Years later I finally stepped foot on a place that had been a dream destination, a spot that is known as one of the most remote inhabited islands in the world. It took us eight hours to fly from Miami to Santiago, Chile, then another fives hours flying straight west to Rapa Nui, aka Easter Island. I had never felt so isolated, just our little foursome and 900 of those stone head statues (moais) to explore. Even though we felt like we were in The Land That Time Forgot, there was still an Internet café, a luxury eco-resort, a Hertz car rental, and a post office that would stamp a moai in your passport for two bucks. There have been other places along the way that felt isolated and undiscovered for a minute or two—until the tour buses pulled in or until we drove twenty minutes away and the McDonalds and KFC started popping up along the roadside. The rock-hewn churches inside of caves in Bulgaria were desolate, but only because we were there after-hours, risking life and limb along darkened, muddy trails (I perhaps forgot the lesson I learned in Peru about hiking). Wait a minute, I think you can see a sliver of temple there on the right. There was exactly one temple around Angkor Wat in Cambodia (the largest religious monument in the world) that seemed secluded. 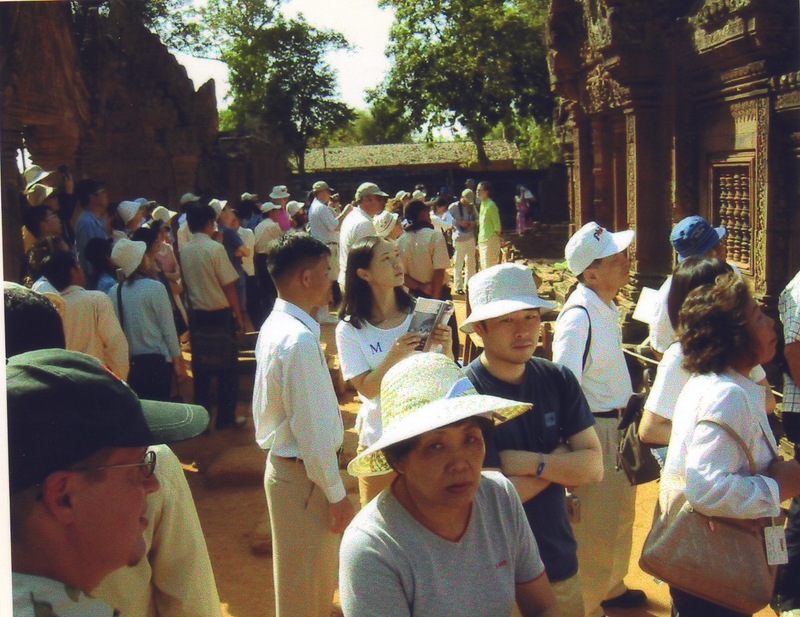 It was the only temple where, for whatever reason, we were the only two there, probably since the 1100s when Khmers worshipped here. Later that afternoon we visited another temple that our guide assured us was the most remote, requiring a bumpy 50-minute ride in an open-aired tuk-tuk with dragonflies slamming into our faces. Upon arrival we saw that a quarter of the population of Tokyo had decided to visit this “remote” locale as well. All of my photos are 95% Japanese faces/sun umbrellas and 5% temple. Then there was Greenland. 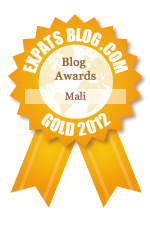 This past summer, feeling a little melancholy leaving Mali after three years, we decided to take a vacation within our U.S. vacation. So, on a whim we chose Greenland, the world’s largest island. And although it was my Fantasy Island destination from childhood, I’d venture to say that most folks wouldn’t go there even if they won a free ticket. “You know, Jeff, it’s not really green,” I would hear. Because naturally I was thinking that Greenland looked exactly like Maui. I knew it was a country larger than Mexico, but with a population smaller than Pine Bluff, Arkansas, and that appealed to me. Although I was desperately hoping it would be nothing like Arkansas (sorry, Pine Bluffians). When you’ve seen the world, there’s always Greenland. An old saying goes, “When you’ve seen the world, there’s always Greenland.” As a kid I’d stare at the world map taped to my bedroom wall, and marvel at how far removed that big old white island was from the rest of the world. 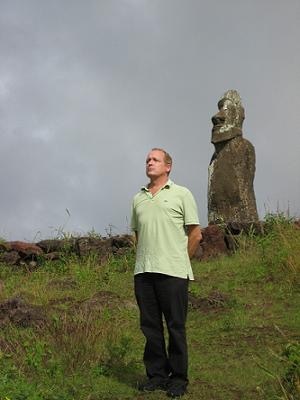 Even though Easter Island was remote, lots of people still went there. Greenland on the other hand gets about 12 tourists a year. 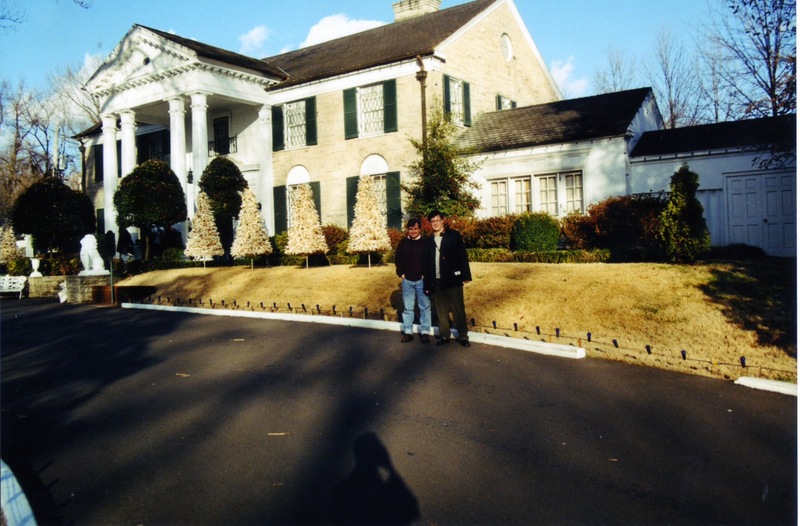 Actually, about 35,000 fly in every year for a visit, but when Graceland–the former home and current resting place (maybe??) of Elvis–gets 600,000 visitors a year, and Legoland California gets 60 million visitors a year, and the Creation “Museum” in Kentucky–which purports that the earth is just 6,000 years young and that humans and dinosaurs chilled out together—gets 250,000 numbskulls to visit each year, 35,000 Greenland visitors seems like a drop in the bucket. the land, and if it all melted the world’s oceans would rise 23 feet (the ice sheet really is melting much faster than usual due to climate change, so start building your ocean front home in Pine Bluff, Arkansas now!). 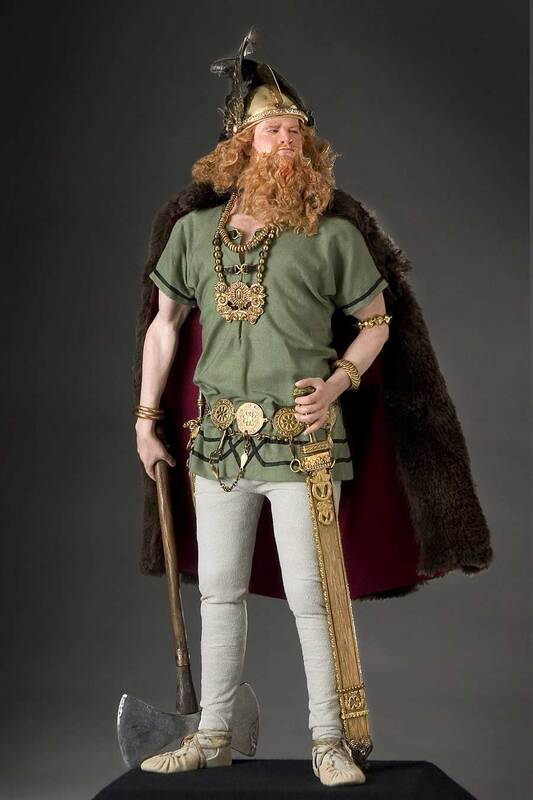 Over the last 4500 years it was settled by Vikings and Inuits and Danish people. Football (aka soccer in the U.S.) is the national sport but Greenland is not a member of FIFA because of its current inability to grow grass for regulation grass pitches. Global warming should change that in the next couple of years. 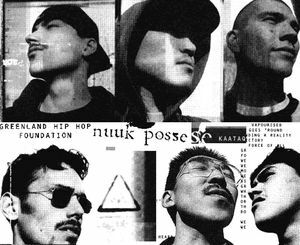 There is a Greenlandic hip hop group named Nuuk Posse whose members are Inuit and who rap in Danish, English, and Kalaallisut, the Greenlandic language. 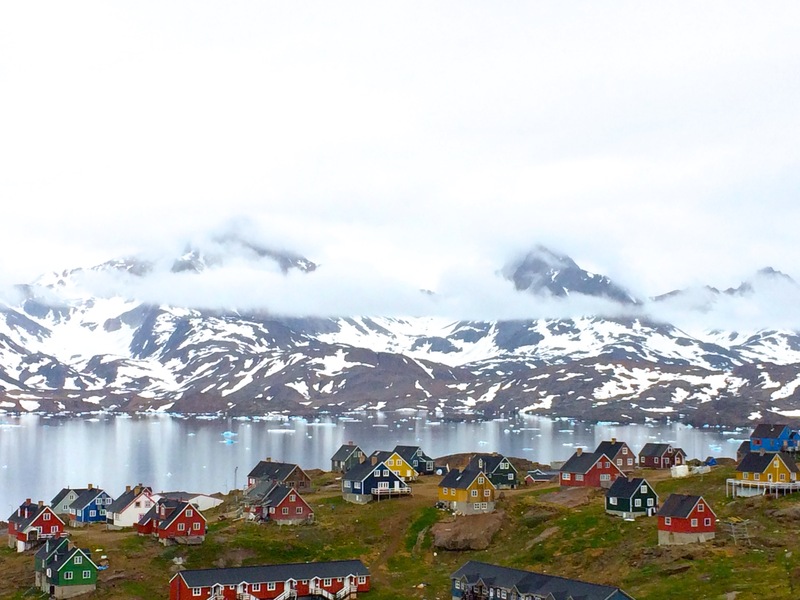 If you list the 20 largest Greenlandic cities by population, the top spot is the capital Nuuk with 16,400 people, and in the 20th spot is Kangaamiut with a whopping 353 people. You have to travel between towns by helicopter or boat because there are zero roads connecting them. We flew Air Greenland from Iceland into Kulusuk, Greenland, population 267. The airport is a former U.S. military airstrip built in the 1950s. 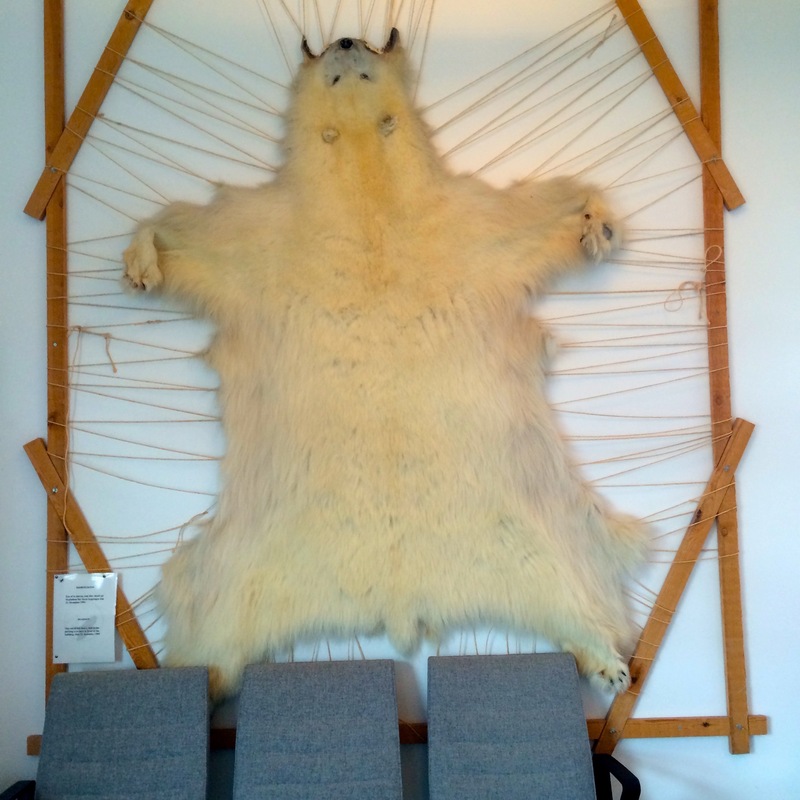 Inside it’s adorned with the skins of polar bears, the animal that’s the symbol of the country and adorns Greenland’s national coat of arms (sort of like if Americans decorated LA International with bald eagle feathers). 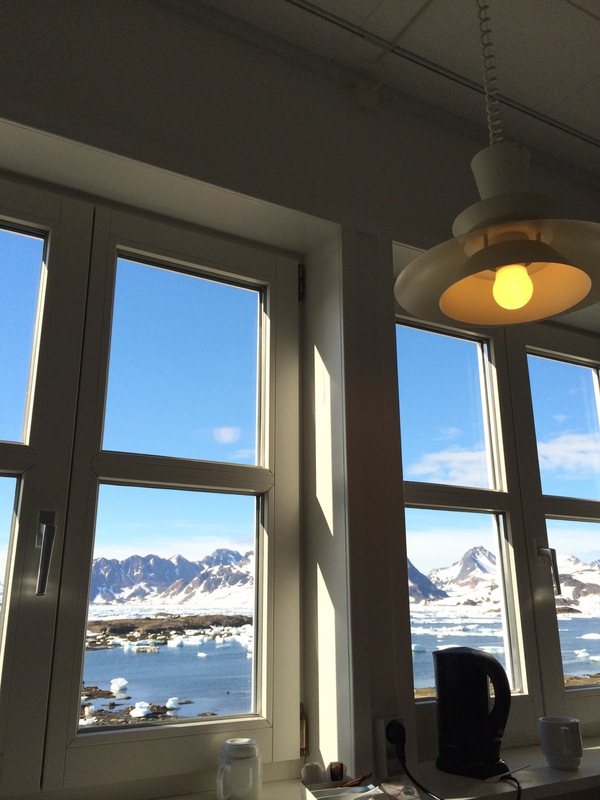 We stayed at Hotel Kulusuk, the one and only hotel option, which on the outside looked sort of like a warehouse, but was cozy on the inside with stunning panoramas from every window of a fjord and snow-capped mountains. The hide of their national animal decorating the terminal. Our room with a view. 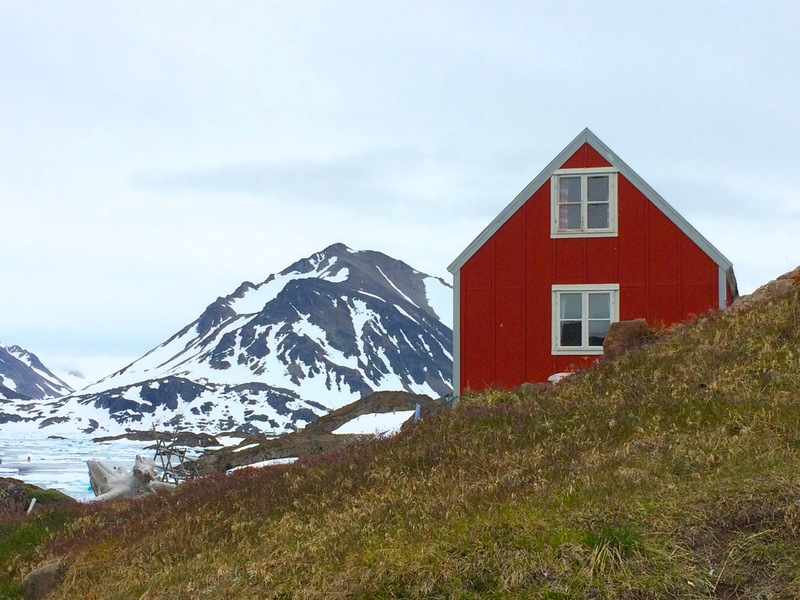 The village, a 30-minute hike down a muddy road surrounded by snow banks, looked like a movie set…brightly colored wooden houses that looked exactly how a kindergarten draws a house with a peaked top and one window and door. Aside from a few local Inuit fisherman working on a boat, we were the only souls around. It was here where we opted to go for a ride in a tiny open-air motorboat into the iceberg filled fjord. 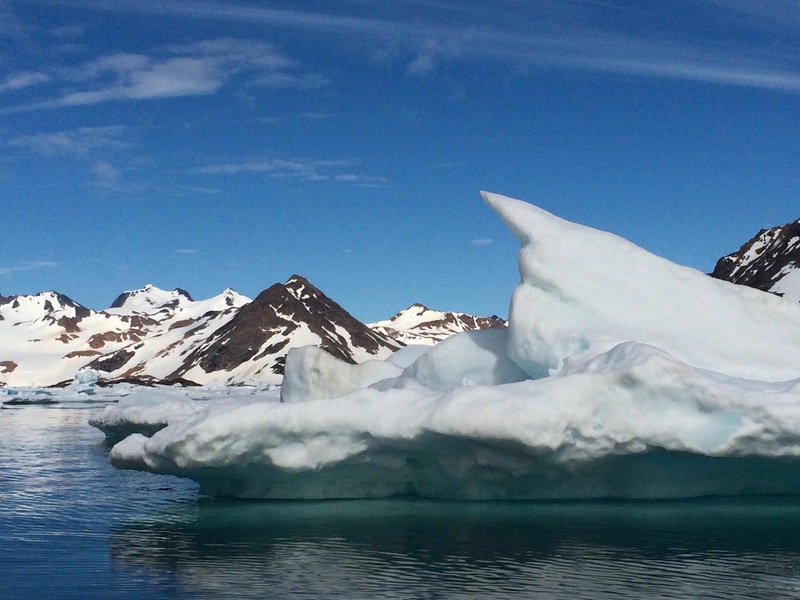 The hotel brochure described this trip as something like a “journey into the solitude,” where our only neighbors would be stunningly gorgeous icebergs crisscrossed by turquoise and jade stripes where melt water from the glaciers has run into crevasses in the many thousand year-old ice. After living in a noisy and crowded West African country, and getting ready to move to an even more noisy and crowded Asian country, the thought of being surrounded by pure air and water and enveloped in silence for a few hours sounded like a dream. A rare moment when our boat mates weren’t using a camera. Then came the group of six Japanese tourists and a young, amorous Spanish couple who would make sure that the solitude part never happened. We all crowded into the teeny orange boat, donned weird, cube-shaped life vests, and put our lives into the hands of the teenage Inuit driver. Although young, he was a master at maneuvering through the iceberg-clogged bay, regularly reaching his leg outside the boat to push the ice chunks away from the boat. 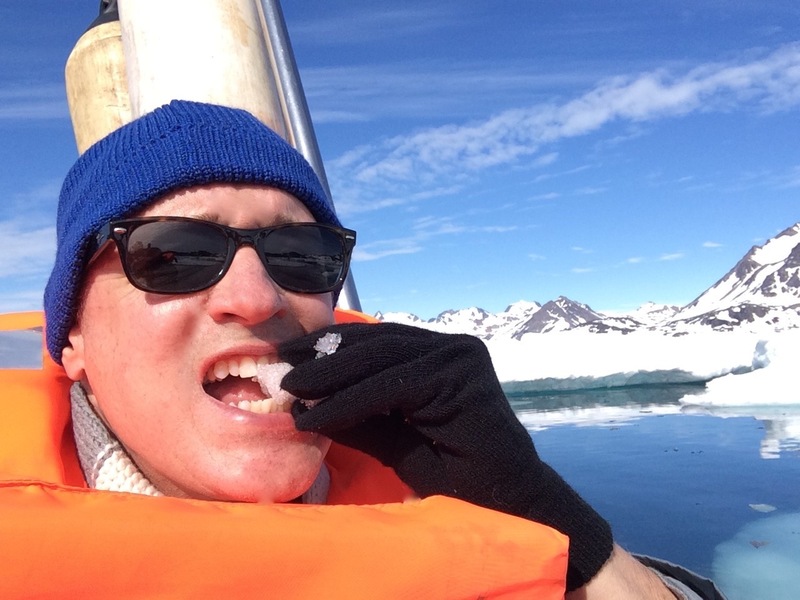 Eating fresh iceberg to numb the pain of rude tourists. Mmmm, tastes like Evian! 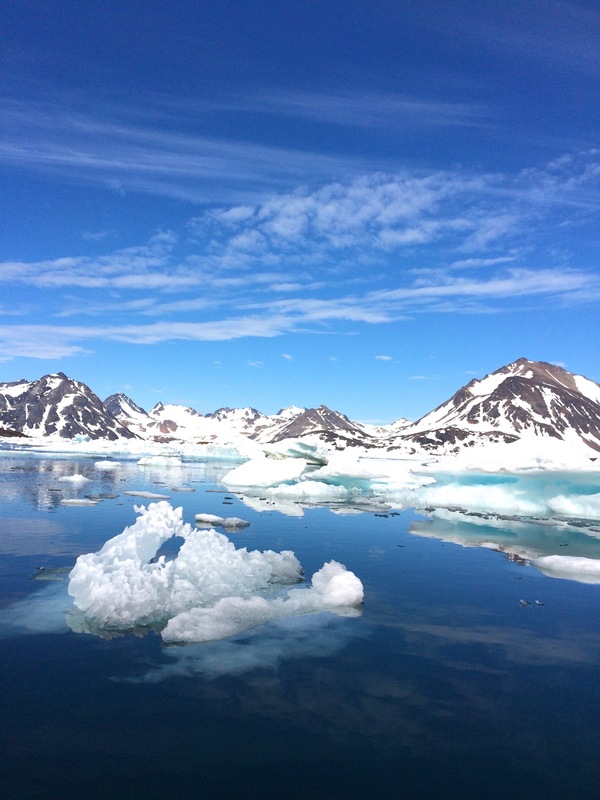 accompanied by loud Japanese and Spanish chatter that reverberated off the icebergs and I’m sure ricocheted across the entire Greenlandic ice sheet, waking polar bears and musk oxen across the country. Add to this the lovefest happening between the two Spanish people a mere two feet from where we sat. Nothing like groping and the sounds of wet, sloppy kisses to accompany our arctic viewing. Seriously, if we had passed close to a flat iceberg, the future little Maria would have had a fantastic story about where mama and papa conceived her. I was sitting within reaching distance of the boat controls. 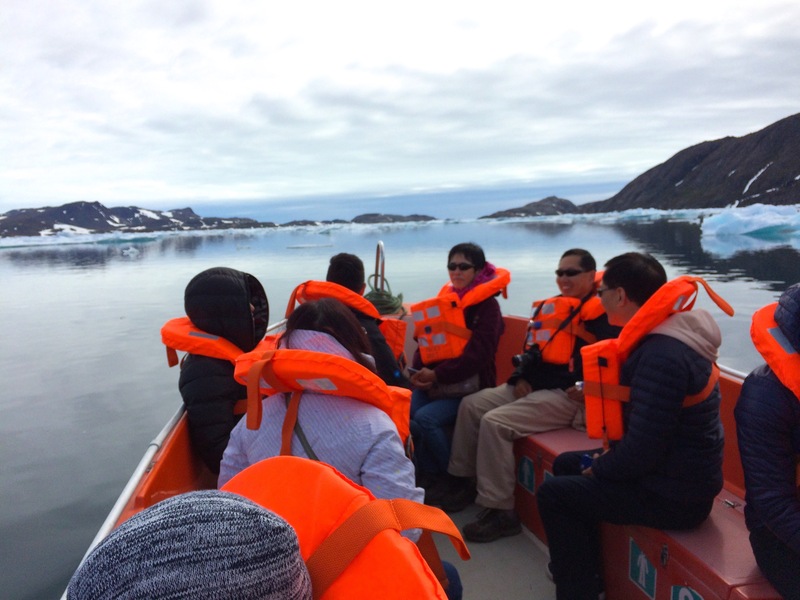 Don’t think it didn’t cross my mind to grab the wheel and violently jerk the boat so that these passengers spilled out into the icy waters and became Japanese and Spanish icebergs. Or that I didn’t imagine how a selfie stick could also be used as a people harpoon. 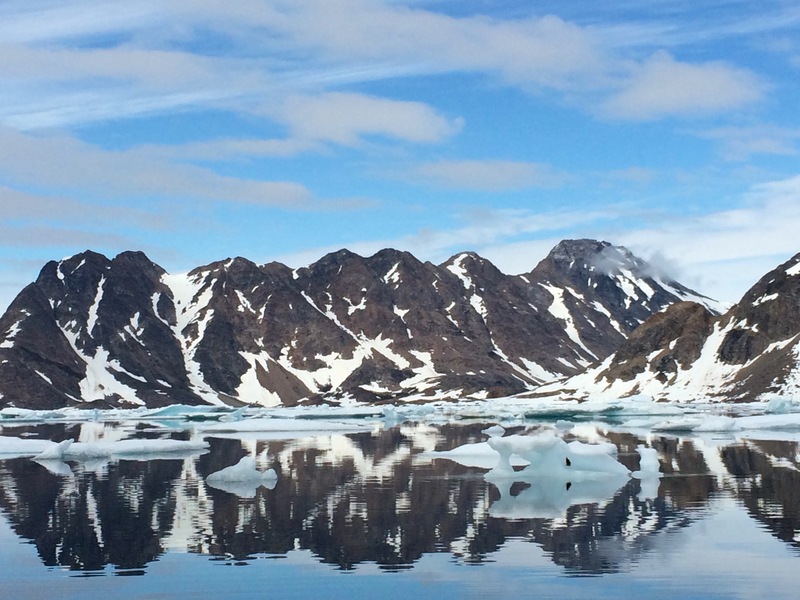 But I avoided a lengthy prison sentence in a Greenlandic prison by just staring out at the snowy mountains and breathing deeply to fill my lungs with the pristine air. Occasionally I would scrape my gloved hand across an iceberg when we were close enough, and pop the ice bits into my mouth (where they tasted just like Evian). This was enough to almost make me stop wishing I were somewhere more remote even though I was in one of the most remote places on earth. Yes, Jamey and I snapped some photos too (that’s where these came from), but 85% of our time was spent just trying to be present in this nearly untouched environment. 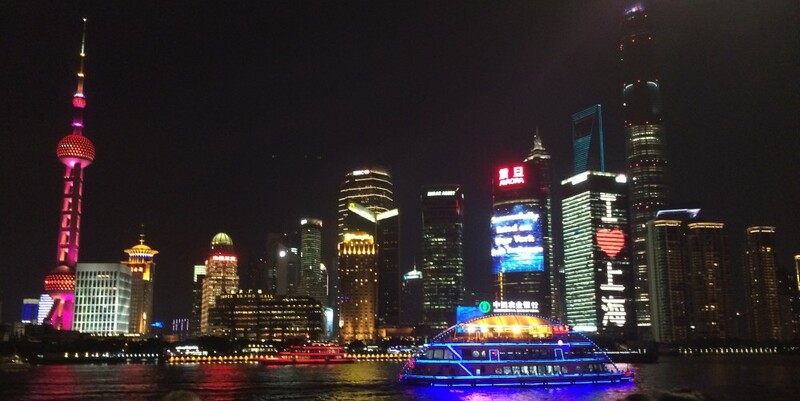 Okay, maybe I spent an additional 5% of the time wishing the rest of the passengers would fall overboard, but aside from that I can still clearly see, smell, feel, hear, and taste this experience. I’m betting that for the others, their only memories are in a bunch of stupid digital photos that none of their friends or families really wants to see (“Oh, and here’s me and Mr. Miyagi laughing at the funny-shaped iceberg that looks like Godzilla, and here’s me and Hiroki laughing at another funny-shaped iceberg that looks like Hello Kitty, and…”). Despite the setbacks I’ll continue my quest to find remote corners of the earth to explore, even if it is a hole-in-the-wall tavern in the middle of nowhere. Just wait until I leave before you take a damned selfie with that stuffed raccoon.